If creative people were easily impressed by the fact that the world has seen virtually everything, there would hardly be any new inventions, there would be a standstill and nothing extraordinary would be developed. Without those visionaries who risk life and limb in badly ventilated garages, windowless basements or smoke-filled pubs to work relentlessly on their ideas, we would still stalk our prey clutching our clubs and believe that climate change is the work of gods. Garages and basements in general seem to be a breeding ground for the great technological and creative revolutions of this world; maybe because only there, men feel truly at ease or maybe because they can only capture the deeper sense of things when they are surrounded by chaos. That is how Jobs and Wozniak did it when they invented the only true computer; Holmes and Watson had their most brilliant ideas after numerous sleepless nights and this was also the case with Fischer and Vogel when they decided to build the first G-RIG. This story is continued in the press kit download beside. Choose from high-res pics, movie, product folder and logos. Beim Kamerasystem Valos von G-Rig handelt es sich um ein 3-Achsen-System, das zur Stabilisierung per Sensoren die Bewegung ermittelt und motorisch ausgleicht. The new camera system Valos, designet by G-RIG, a Vienna based company, is a motor-operated 3-axis system that stabilizes filming and substantially enhances hand-held camera shots. 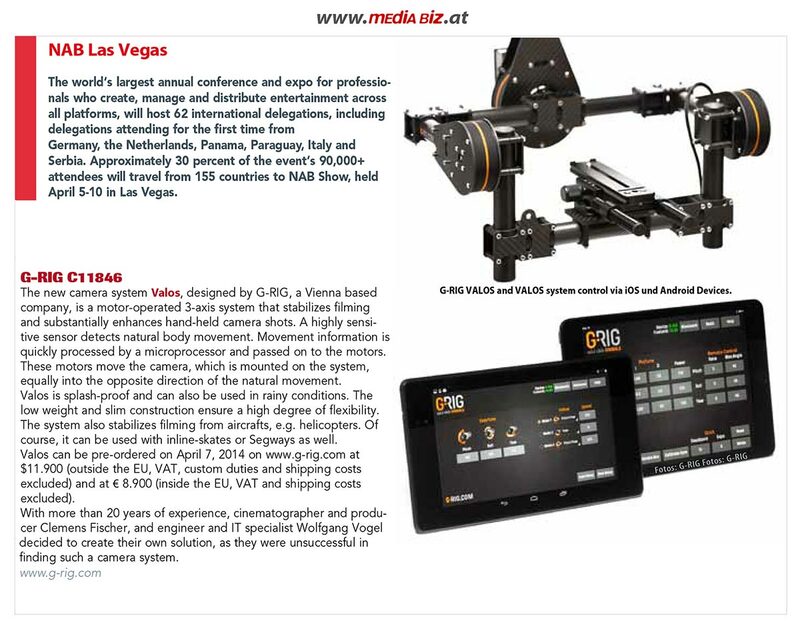 Vienna, Austria based G-Rig has brought its motorized VALOS 3-axis camera rig to the 2014 NAB Show in Las Vegas. Unlike Steadicam-type mounts, the VALOS uses active stabilization techniques. NAB2014: Kamerastabilisierung Valos von G-Rig Die beiden Österreicher Clemens Fischer und Wolfgang Vogel haben das gyrostabilisierte Kamerasystem Valos entwickelt. Im Video stellen sie Valos vor. After last year’s release of the handheld “game changing” Movi stabilizer, we are fully expecting plenty more gimbals from a number of companies. One of those is the new G-RIG VALOS solid state gimbal, which is launching this week at NAB 2014.